Six years into the frenzy that is the internet of things, a big business problem has emerged. Most connected devices require some kind of ongoing maintenance and fees associated with good security, software updates, and cloud costs. In cases where a connected device uses cellular connectivity, there’s often a subscription fee as well. For manufacturers, this poses a challenge. It’s hard to price something that is going to cost an uncertain amount to support over the long term, especially if you don’t actually know how long that term is. For example, I have WeMo switches in my home that I installed in 2012 that still work (and still require updates). The solution to this problem has so far been to either charge a subscription fee, or to just push out a product and not worry about it. The latter strategy can cause problems, however, such as the challenges Canary or Chamberlain experienced when each later tried to charge for features that users thought should be free. In Canary’s case it pulled some features a subset of users were accustomed to getting for free and made them part of a subscription plan. In Chamberlain’s case it started charging users to integrate their garage door openers with the IFTTT service. So far, the most successful subscriptions have been those associated with later access to video camera data that customers know about going into their purchase. But some of the uncertainties associated with cloud and connectivity costs may be diminishing as big companies eager to expand the internet of things start trying out new pricing models. An early indication of this was an Amazon button launched in November of 2017 that featured LTE service provided by AT&T. It cost $30 and was aimed at the developer market. Instead of charging a monthly fee for the LTE-M connectivity, AT&T baked that into the $30 price tag. Chris Penrose, head of AT&T’s IoT division, says that the LTE-M button is good for 1,500 presses (or about two years of service), and is an example of how AT&T is trying to think differently about pricing service for connected devices. The upshot is that someone could buy this button, place it anywhere, and get a message in AWS when someone presses it. That may not be useful to everyone, but it does mark the beginning of a new way to price access to cellular networks. This week, we have another, more compelling example. Twilio has launched a narrowband IoT SIM with T-Mobile. The Twilio NB-IoT card will get your IoT device on the network for $2 a month, and includes 12 MB of data. The plan is aimed at sensors and other small devices that need mobile access to send small amounts of information. A good example might be a connected pet collar or a location-tracking device for a corporate car. Chetan Chaudhary, general manager and vice president of IoT at Twilio, says that developers can get the SIM card and handle payments and activation through Twilio’s existing software platform. This developer-friendly approach offers both price certainty and a familiar environment to get developers excited about the possibilities of cellular for connected devices. I think it will stimulate far more interest and experimentation than the Amazon LTE button. But Amazon has another solution to the pricing uncertainty surrounding long-lived IoT devices. 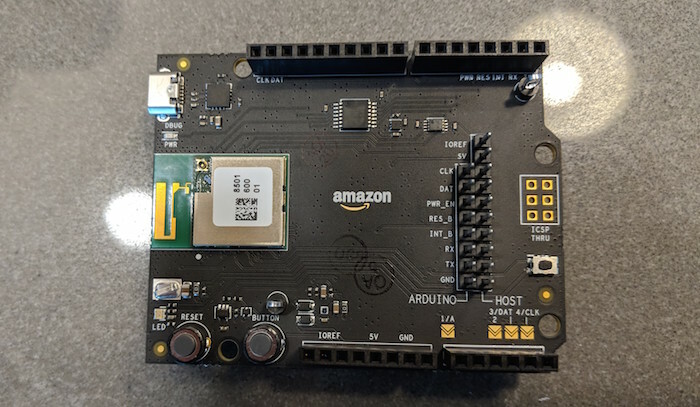 Along with its new Alexa Connect Kit (ACK) module announced last month, it offered to include cloud costs as part of the module costs. I asked Amazon what ongoing cloud costs the module might include, but it appears the e-commerce company is still working out the details. An Amazon spokesman said the plan is to offer manufacturers everything they’d need to create an Alexa-connected product for a low, fixed, and upfront fee. That could include device control, ACK module maintenance, fleet management tools, as well as access to device metrics and log data. From there, device makers could also connect to other AWS services, such as the Dash Replenishment program and the easy set-up service that Amazon also introduced in September. Things like long-term data storage and data analytics from the connected device would likely not be included in the module fee. That seems fair, and there are several solutions that a company could build that take advantage of those included services to build a compelling product. The ACK module is still in developer preview, so I expect we won’t see anything built on it become available for mass consumption anytime soon. Twilio’s NB-IoT developer kit is now in early access pilot program. However, all of these experiments and products signal a new era for connected devices — one where subscription plans aren’t always necessary and ongoing costs aren’t as much of a concern.